Grand Deal? No Deal? Clock Ticking As Deficit Talks Continue : The Two-Way Deficit-reduction negotiations continue. A deadline looms. But beyond that, not much is certain about what will happen. They're still talking. 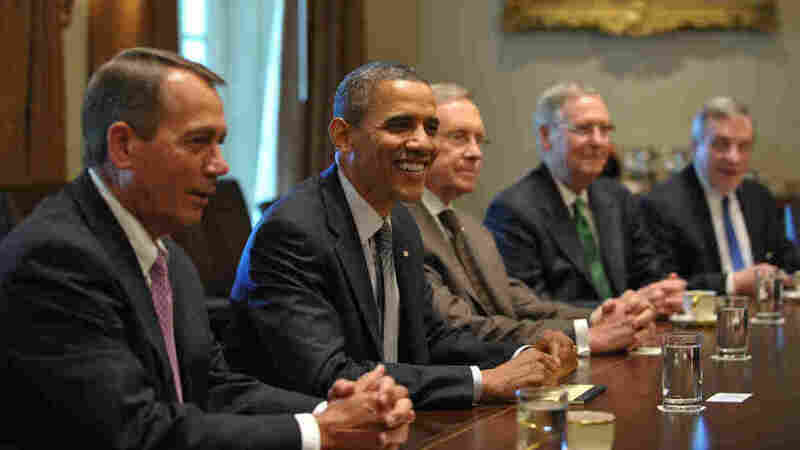 President Obama and leaders from Congress will continue deficit-reduction negotiations. July 14, 2011 file photo taken at the White House. From left to right: House Speaker John Boehner (R--OH); Obama; Senate Majority Leader Harry Reid (D-NV); Senate Minority Leader Mitch McConnell (R-KY); Senate Majority Whip Richard Durbin, (D-IL). We know for sure that negotiations continue between the White House and the Republican leadership in Congress over how to extend the federal debt ceiling, trim federal deficits and start reducing (or at least stop its explosive growth) the $14+ trillion federal debt. And we know the White House says a deal has to be reached by sometime Friday in order for there to be time to get a package passed and signed into law before the government hits that debt ceiling on Aug. 2 and won't be able to pay some of its bills because it won't be able to borrow any more money. -- ABC News says it has been told by "Capitol Hill sources" that President Obama and House Speaker John Boehner (R-OH) "are again talking about reducing the deficit by more than $4 trillion over the next decade or so." -- But Politico notes that "Republicans will bring to the House floor Tuesday a newly revised debt-ceiling bill that is remarkable for its total absence of compromise at this late date, two weeks before the threat of default." That's the "cut, cap and balance" plan that, as The Associated Press writes, would "let the government borrow another $2.4 trillion — but only after big and immediate spending cuts and adoption by Congress of a constitutional amendment requiring a balanced federal budget." While it's expected to pass the House, the plan is not expected to get an OK from the Democratic-controlled Senate. -- Meanwhile, The Washington Post says that "a bipartisan effort in the Senate to allow President Obama to raise the federal debt ceiling in exchange for about $1.5 trillion in spending cuts over 10 years gained momentum Sunday, as leaders agreed they would have to act in the next two weeks to avert a potential default by the U.S. government." "The growing sentiment for raising the federal limit on U.S. borrowing sets the stage for a week of largely scripted actions on Capitol Hill, where leaders in both chambers are looking to build support for the plan being crafted by Senate Majority Leader Harry M. Reid (D-NV) and Senate Minority Leader Mitch McConnell (R-KY)."